I have been listening to my kids too much I think! Although, I may have found a cure for that or a similar phrase. I said, "someone please let the dog out." One of the boys instantly replied, "I'm not!" Any guesses as to who earned the privilege of letting him out? Yep, the one that said he wasn't. This is the card I gave my oldest. There really isn't a rhyme or reason to the card. He likes camping and of course, smores. There is lot of dimension. The set is from SU! and called Under the Stars. I used Flannel Plaid for the background. Where have I been? I am not certain. I've not been able to catch up with myself! I have been a little creative but nothing I can share just yet. I am going to leave you with a recipe. 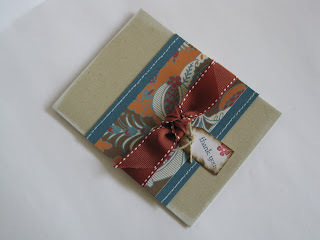 Then I am going to go make my son's birthday card. So, I will have something to show you. Since he doesn't read my blog I can post it and it won't ruin the surprise. I made this recipe up in college. I have had lots of compliments on it. I love that it is so fast too! Brown chicken and cook until done; set aside. Melt butter and olive oil in pan and saute onions and peppers. Stir in picante sauce (or salsa) and remaining spices. Add chicken and heat through. Serve with tortillas, cheese, sour cream, lettuce, tomatoes and any other toppings you like! Just when I think my week is going to be fairly calm, I remember all the house work that got neglected last week in the busyness. However, I couldn't possibly let you all down again. 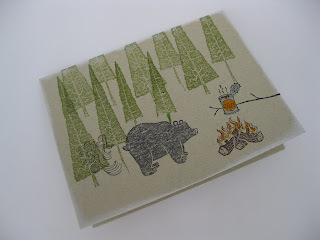 So I took just a little break to make this fun little card and three little friends to go with him. I pretty much copied one from the current SU! catalog. I changed a few elements, though. I used some new in colors: rich razzleberry, melon mambo, and crushed curry. I also used old olive and white craft ink. I used a fun sparkly ribbon I had on hand. I used a SU! punch to give the greeting some dimension. I might have also used it to cover up a crooked greeting. I know I have mentioned it before, but I really like the shabby chic look. 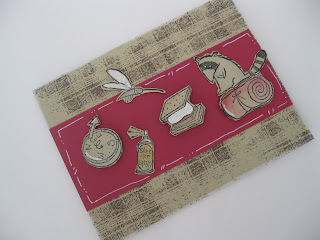 I was trying to make a shabby chic card in the gift set I posted last week, but I had to get creative. I had lost my "shabby chic'er" aka bone folder. I had the idea planted in my head that one of the short people around here may have borrowed it and forgot to return it. I don't like to be the one that accuses someone and then feels foolish when I find it some random place that I know I put it. I have a child that frequently, adamantly insists someone took a toy or loved item, and it almost always is exactly where he left it. What a fantastic learning opportunity. My kids teach me so much. My beloved bone folder made an appearance today, and I am so glad I didn't fuss at anyone over it because I am quite certain none of my children were in my rolling scrap bin. 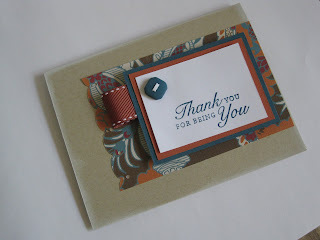 The stamp set I used is called For All You Do. 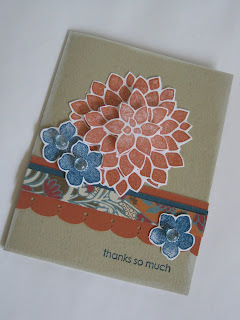 I got it in my Stampin' Up! starter kit. Speaking of which, I will have my first workshop/open house on October 2. I will be having a discount for orders placed that day and prior to that day. I will give you more details soon so get your wish lists gathered! Since I have abandoned my faithful readers for so long I will make a confession. OK so it's more like a public humiliation type thing, but entertaining. My family was at the public pool about a month ago. We were standing in line waiting to get in. One of my sons, ever so innocently asked, "boys have that thing too?" I was like, "Huh? What are you talking about?" He pointed down at the man's feet. His heels were cracked. I am pretty certain I turned several shades of red. Don't worry, I didn't take a picture of my feet for you. I did, however, take some pictures from the awesome weekend our family had. Here is just one. Can you forgive me for not being crafty? I will have something creative on Monday for you. 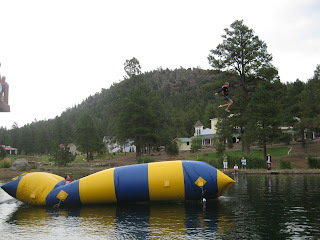 You'll never guess what I did today! I'll give you a hint, it's hidden somewhere in the title. Yes, I did laundry and made a gift. Keeping up on laundry has advantages and disadvantages (believe it or not). I choose to do wash every other day so that I don't get overloaded since I have a ginormous family and because who in their right mind wants to do laundry every day? The disadvantage of doing laundry every day is that I have a certain child or two that wears the same clothes every other day. People are going to start feeling sorry for him/them! This morning one of them asked me where his yellow shirt is. Oh, the one you wore the first day of school and every other day since then? OK so I didn't really respond that way, but I did ask him about the other 20 shirts in his drawer. I guess on the upside, if he doesn't wear them he won't wear them out. After all, they have to make it through one more child. 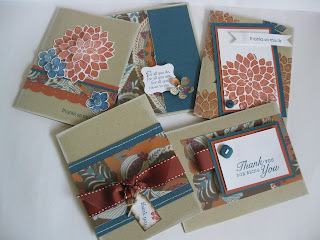 These are the five cards I made for one of the teachers for her birthday. 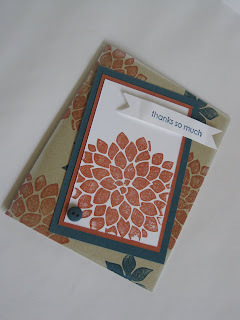 I just used various Stampin' UP! stamps and some designer paper that a friend gave me. I love these colors. The card stock and ink I used is Not Quite Navy and Really Rust. If you have any questions about any specific card let me know. I got some of my kit, but am still waiting for some of it. I will keep you posted on when I am going to be ready to hold workshops and classes. 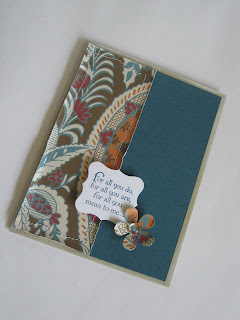 Here is a card I made for a wonderful friend. It's very basic, but makes it point. There is a cross stamped in versamark, and I painted it with the shimmery pearl-ex watercolors so it would stand out a little more. 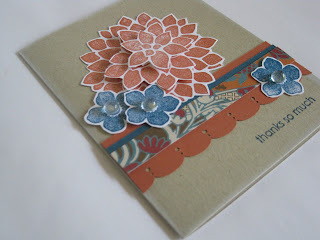 I pierced around the scalloped piece and then used a white gel pen to make little highlights. 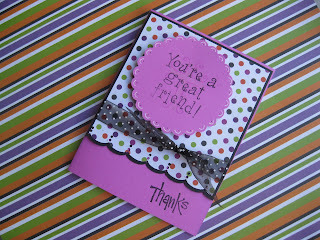 I used a Martha Stewart punch to make the scalloped edges. 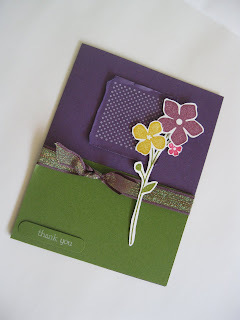 The main greeting image is from Stampin' Up! 's All Year Cheer II set. 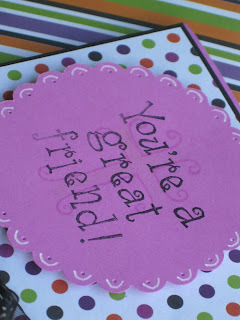 *I will be looking for people (in the greater Phoenix metro area) to hostess workshops. *I will be having an open house. *I will be offering classes. *I will be looking for people to join stamp club. *I will be start a Stampin' Up! website as well to give you more information. I am very exited to start this new journey, and I hope you will join me in some capacity! Have a great day and get ready to shop and craft!